Behind every Four Petits Choux design is a tight knit team of collaborators including and most notably you, our client. As you would expect, we grew fond of Jannah and Kiel as the wonderful visionary couple that they are, and we were equally inspired by their awesome brief. 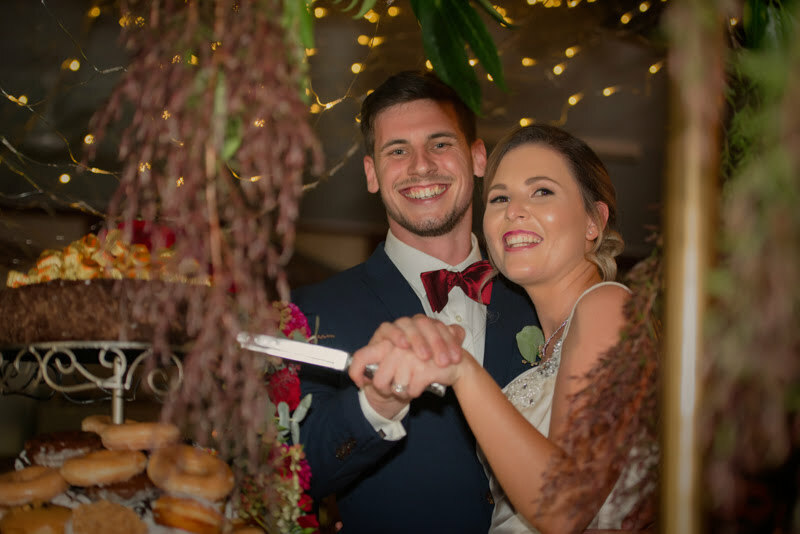 Theirs was a rustic waterfront wedding with post-­ceremony refreshments on the cobblestone courtyard, followed by newlyweds and their guests partying in the hall at the South Brisbane Sailing Club. A fresh green and deep burgundy palette with absolutely “No white” was key for Jannah and Kiel’s quaint wedding infused with brass and antique gold centrepieces and accessories. We integrated a touch of navy blue throughout to match the groom’s attire because we’re all about that harmony. 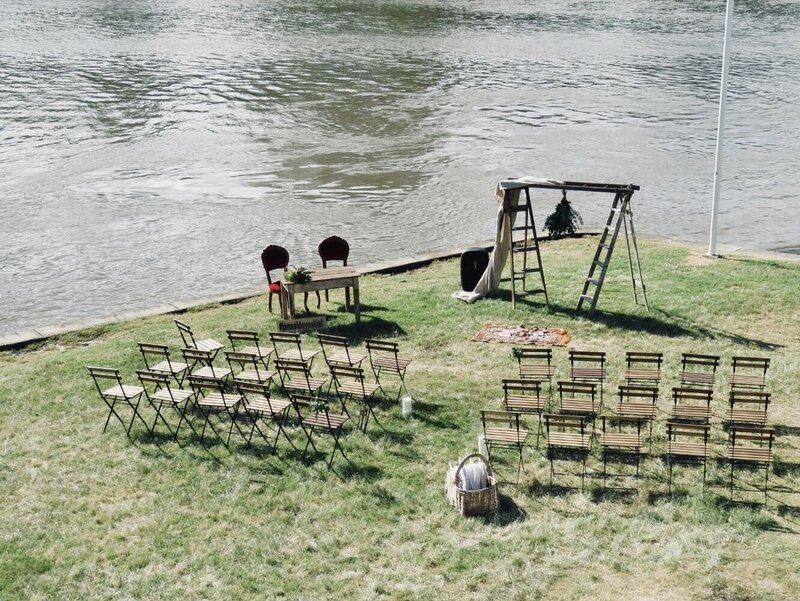 We adored every element that went into creating this special day. 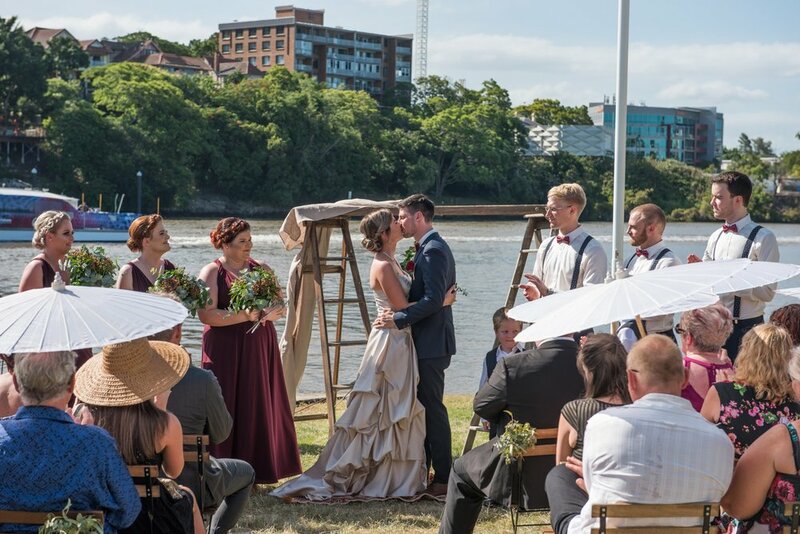 The highlight was witnessing the gorgeous bride walk down to her awe-­struck groom against, what we feel, was a simply idyllic backdrop overlooking the Brisbane River. We also couldn’t look past the stunning foliage installation in the reception hall that hung over what was a pretty impressive tower of doughnuts! Positioned on the top tier was a delicious looking dark chocolate cake topped with Hershey’s peanut butter cups and a cascading blend of roses and dahlias. Safe to say, we loved working alongside some pretty talented folk, including our dear friend and longstanding collaborator Erica, who whipped up, yet again, some ridiculously good-­looking floral creations, including those for the entire bridal party. Big thanks to the wonderful folk at Brandition, Vintage Empire, Beautiful Weddings and Prop It Pretty for the beautiful vintage furniture and accessories. Cheers also to our enduring and committed team who make up Four Petits Choux, including a small portion of our extended family who made a special appearance helping out on the day.